Fleet Farm Weekly Ad September 14 - September 22, 2018. Anniversary Sale! 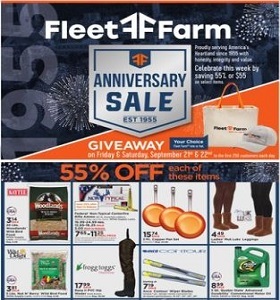 Fleet Farm Weekly Ad September 14 – September 22, 2018. Anniversary Sale! -$99.99 Pro-Lift 3-1/2 Ton Speedy Lift Floor Jack; $17.99 Rubbermaid Roughneck Trash Container with Lid.